time. He gave me some good info about surf in the area, especially Mavericks. Since then, I've met and surfed with a bunch of A.Sers. And despite any satirical trolls to the contrary, they've ALL been good, fun interactions. On that same bike trip, I stopped in at Bodega Bay and met Will Borgeson. He gave me a great tour of the institute there, then we hit the surf for a chilly session. Neal Miyake's trips to San Diego were the incentive to meet some other San Diego A.Sers. I got wet with Tom Tweed, Neal, Rontiki and met Bill Andrews. Foon's trip to San Diego instigated a great day cruising with George Barnes. George has been good about spreading the points around. He introduced me to Carson and Rod Rodgers, although the meeting with Rod seemed awfully short. Perhaps we can fix that on his next trip west. JoAnn VanMeter and I had a nice lunch with tons of gossip at the Brockton Villa, a nice place overlooking La Jolla Cove. There have been a few San Onofre get togethers, including a couple of Paloozas and the Dale Davis party. I met Neon, Craig, Dan "Crag T. Bagger" King, John Hermesman, SD Beachguy, Tim Maddox, BK, Dan'L, Sunash, and Son of Sunash. There were probably another ASer or two that I don't remember, and I'm not sure how many of us were in the water together, but I think the list at the bottom is correct. for the latest Palooza, Ben Rak was in town. i gave him a ride and a tour of the coast. When Andy Woodard came west, I gave him another guided tour of the North SD County coast. And Rick Ciaccio has come down to surf my home break a couple of times. Aug. 29, 2001. Hooked up with Neal Miyake, Bill Andrews, and Joanne VanMeter for Sushi after their session at La Jolla Shores (Dan King also surfed but didn't stay for sushi). Truth be told, J & BA were too chicken, er, had chicken instead of sushi. (Sheesh. What is it with a little seaweed and eel that turns people off?) I just hope it was up to Neal's standards. FWIW, Neal drank twice as much beer as the last time I saw him. The lush. As usual, whenever A.Sers get together, it's a fun event. Thanks for the laughs, folks. In the Lap of America... The Four Points Bike Tour of the Contiguous USA. In the immortal words of Dennis Miller, I Am Outta Here! FWIW, I'll be living at : keensurf@hotmail.com for a while. Aug 13, 2001. I'm bored. It's time for me to see some new places, meet some new faces. I've got itchy feet and a fast motorcycle. The Silver Surfer (my trusty Honda) is tuned and ready to ride. I'll be leaving soon to see how many miles I can put on it in an all-too-short vacation. So, if any of you are desperate to score another point on the A.S spreadsheet of camaraderie, drop me a line and we'll see what my itinerary looks like. Sorry, Havard and Alex, you guys will have to wait til next year. This is strictly on the North American continent. Sept. 3, 2001. Agent Utah reports meeting Keener with typical PNW hospitality. Sept. 3, 2001. Lemmings relates stiffing Keener with a PNW-sized bill. a New England Beach going off, even if from shore!....and it was so great to be there by his side, as he observed it with much stoke and interest, & as he asked questions of some NE surfers walking by after their sesh, with boards in hand. I knew every second of our visit, that I was a lucky New England gal, to get to spend a few hours talking story & hearing the knowledgeable, indepth stories & observations about surfing, life & this amazing planet that we all reside on, that Santa most generously shared with every question I asked. It was equally so great to hear more about growing up & surfing in San Diego! It was really inspirational watching him take off from our drive way....in full rain gear, with the rain pouring down ....on his Righteous, Rumbling Motor Bike, 'The Silver Surfer', heading for I-95!!!!!! Talk About Pure Adventurous Stoke! Sept. 15, 2001. 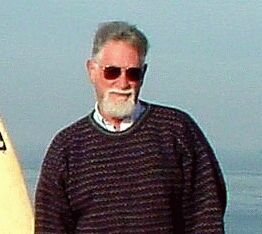 John Webster of Providence, RI, comments, "I heard a little about his trip, and man does that guy know how to miss waves. I hear he missed them in the PNW, he missed them on Cape Cod, and now he missed them in Rhode Island. Never take a surf trip with this guy! :-) "
March 30, 2002. Steve 'the Mind" Marshall's Visit to San Diego. Did not surf but did get together with Bill Andrews, Joanne VanMeter, SteveM, Dan King and Terry Hendricks at Joanne's place (see pic). 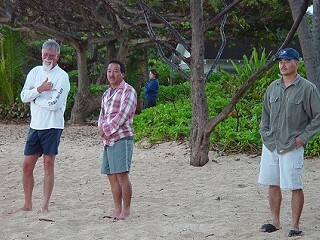 Tom Keener Visits Oahu - 2003. AS Party at My House - March 2003. "That's right - it's party time. Alt.surfing's Drew and Glenda are visiting SoCal, so we've got to have a party." ~TK. Pic posted at Joanne's site: Pic 1 and Pic 2. Yellow Bamboo Power in San Diego - July 2004. The evidence is pictured here. August 2004. Bodysurfed with Sully. Yooper Comes to Dinner - June 2005. Read the reports and see the pics here. Gamivia Duke - met him both in SD & SF. LP - met him at Ocean Beach in SF. Gioni Pasquinelli - on his trip to SD. Dave Blake and I shared waves at Black's. Mike Gemelli and I had a couple of sessions. One of the few who's had fun at my home break (April 2004). LJS and I did a small day of bodyboarding in Solana Beach, when she came to SD County.